Executive function is an umbrella term for the complex cognitive processes students use to set goals, plan their time, organize and prioritize ideas, think flexibly, access their working memory, self-monitor, and self-check. These processes are critical to ensure success in school—students who struggle often fail to complete assignments because they do not know how to complete the work. When students are able to use these executive function processes, they can coordinate (or funnel) the various tasks and skills required to complete their work; when students struggle, they feel as though their brains are “clogged” with information and they are unable to produce work that reflects their abilities. Unit 1 Overview: Video 1 from ResearchILD on Vimeo. SMARTS is a unique, evidence-based online curriculum that provide educators with a year of executive function strategy instruction. 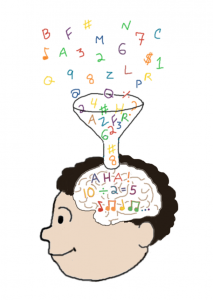 Using the SMARTS curriculum, educators can teach their students executive function strategies, also known as executive function skills, for “unclogging their funnels,” helping them to make meaning out of what might otherwise be overwhelming. SMARTS contains 30 lesson plans—with accompanying videos, handouts, and PowerPoint presentations—that can be used as a standalone curriculum or as a supplement to existing curriculum. SMARTS is designed for students in grades 6–12 and can be used in traditional classrooms, learning centers, special education classrooms, and tutoring sessions.